Camp USA – Lifeguard Jobs! Camp USA are now recruiting Camp Counsellors for America’s top Summer Camps where a typical day involves swimming, kayaking, arts and crafts, tennis and countless more awesome outdoor activities! We need Qualified lifeguards, sailing instructors and anyone with experience or a passion for water-sports so please get in touch if this sounds like the ideal experience for you next summer! 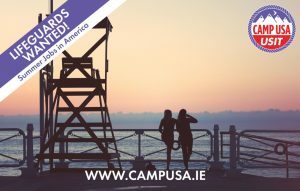 We love to chat about all things Summer Camp so give us a call on 01 602 1808 or email campusa@usit.ie or jump over to www.campusa.ie to book online directly. internationally recognised lifeguard qualifications here in Ireland. We offer Beach lifeguard courses in Cork, Clare, Galway, Donegal, Dublin. We also offer Pool lifeguard courses Nationwide!